Loan Officers should write letter of explanation to mortgage underwriters on behalf of borrowers or write them together. 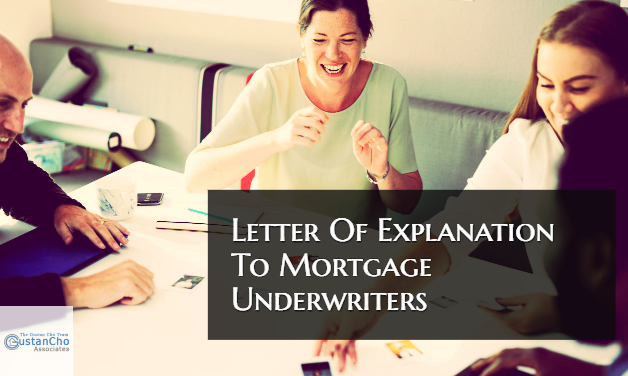 What Types Of letter Of Explanation To Mortgage Underwriters Are Often Requested? In the event if borrowers file needs clarification, the underwriter will request a letter of explanation. Borrowers with extended period of bad credit but has since recovered and re-established themselves can qualify for mortgage. Documentations and supporting facts shows strength and mortgage loan underwriter will rule in borrowers favor. Mortgage Borrowers with any further questions on how to write letter of explanation to mortgage underwriters feel free to contact us at Gustan Cho Associates at 262-716-8151 or email us at gcho@gustancho.com.